How to Attract Pollinators to Your Garden | Warner Companies, Inc.
You can help your garden – and the eco-system in general – by becoming a welcoming host to some of the hardest working horticulturists around. These gardeners are very different from each other, but have three things in common – they love flowers, have names that start with “B,” and are winged. Birds, Bees, and Butterflies are essential to the process of pollination, and a few strategic choices in your garden will help them thrive and improve your space as well. Let’s start with bees, who are the reigning champs in this category. 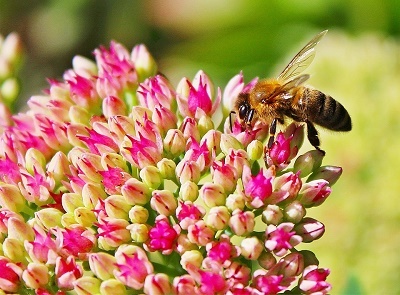 Responsible for 70% of the world’s flowering botanicals and a large number of its fruits and vegetables, it is estimated that 1 of every 3 bites of food you take is due to bee pollination. Which is why it is so concerning that bees have been in decline over the last few years, with an alarming number of colonies dying off or being abandoned. You can help in the worldwide effort to bolster bees by cultivating a garden that attracts them with the tips below. Butterflies are less efficient than bees because of their body structure but are still important pollinators. They probe for nectar and favor flat, clustered flowers that provide a landing pad (also important because they “taste” with their feet!) Also, unlike bees, butterflies can see red and are drawn to bright colors like red, yellow and orange. 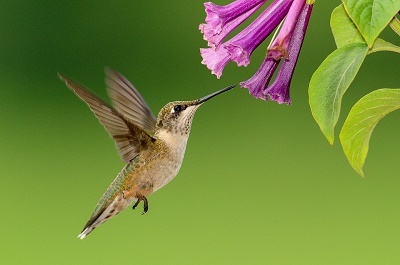 The key to the birds’ role in pollination is more limited and in the United States, it is the tiny hummingbird who does a huge share of the work. Which is understandable – they have to visit a lot of flowers to get the fuel they need! These little dynamos (they weigh between two and eight grams) beat their wings about 70 times a second and have a heart that pumps 1,200 times per minute. That amount of activity requires a lot of nectar and hummingbirds typically eat several times their weight each day. So how can you bolster these amazing pollinators? There are several methods to practice long-term cultivation of birds, bees, and butterflies in your own backyard. Create habitats for pollinators by supplying necessary water, food, shelter, and places to raise their young. Plant a section of native plants and wildflowers to increase nectar and pollen sources for butterflies and bumblebees. You can find a list available from Warner’s Nursery below. Choose a variety of plants that will bloom in rotation throughout the growing season. For example, crocus and wild lilac in the spring; snapdragons and foxglove in the summer; and zinnias and asters in the fall. Choose a variety of colors and shapes, as different pollinators are attracted to different types. Flat petal flowers are a good landing pad for butterflies; funnel-like flowers attract hummingbirds; and both like bright colors. Bees can’t see the color red (blue and yellow work however) and are attracted to sweetly aromatic blooms. Build or purchase a “bee condo,“ or leave dead trees or limbs for nesting habitats. Use bee-safe pesticides and follow the directions for use carefully. Warner’s locally grown native plant selection, as well as all the other quality plants from our nursery, provide multiple food sources for pollinators. They will also keep your yard looking lovely too!